Holyrood Palace, Edinburgh, Scotland. The official Scottish residence of the Queen dates from the late 15th century, but was reconstructed for Charles II in the 17th century. Mary, Queen of Scots came here in 1561 and stayed for six tragic years. State apartments house tapestries, paintings and furniture, and the picture gallery has portraits of 89 Scottish kings. 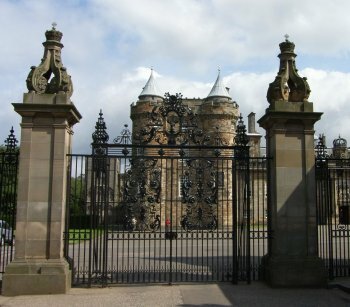 Adjoining palace is Holyrood Park, rich in animal and plant life. Holyrood was built under the orders of James IV in 1498, who enlarged an existing guesthouse of the nearby abbey. Little of the original building is left today. Fifty years after its construction, the palace suffered serious damage by the Earl of Hertford's troops and a century later Cromwell's army left their own mark on it. By the time the monarchy was restored, there was little left of the grand palace that Holyrood had once been. In the 1670s, Charles II ordered the palace to be restored, and Sir William Bruce redesigned and reconstructed large parts of the building. In the event, Charles II never even visited Holyrood to appreciate the marvellous craftsmanship, but it is him we have to thank for the continued existence of this beautiful royal home. The most famous wedding of all to take place here was that of the twenty-two year old Mary, Queen of Scots, to the nineteen year old Darnley on 29th July 1565. Darnley placed three rings on Mary's finger and knelt beside her while the catholic priest said prayers for their union. Darnley, whose vacillating religious beliefs were notorious, was Protestant at the time and left Mary in the private chapel of Holyrood to hear Mass. Mary was dressed in black mourning to represent the widow's life she was leaving behind. After the ceremony she was divested of her mourning clothes and robed in a brightly coloured, jewel-encrusted outfit. A trumpet fanfare accompanied the couple's procession to the Great Hall where a sumptuous feast awaited them. Crowds cheered outside throwing gold coins, while Mary and Darnley were being entertained with a masque and a dance. Atholl, Morton, Crawford, Eglinton, Cassilis and Glencairn were present at the banquet to attend the couple. These festivities continued for the following two days, but he euphoria was of short duration, as Mary soon realised that she had married a complete fool. On 15th May 1547, thirteen weeks after Darnley's death, Mary and Bothwell were married in the Council Hall of Holyrood in a Protestant ceremony. Adam, Bishop of Orkney and friend of Bothwell, preached a sermon to the effect that Bothwell had repented of his former life of evil and wickedness, while Huntly and Maitland were among the witnesses. This short ceremony was followed by a dour wedding breakfast eaten in silence. In stark contrast to her previous two weddings, there were no rejoicings or expensive trousseau. Mary contented herself with an old yellow gown relined with white taffeta, an old black dress decorated with gold braid, and a black taffeta petticoat refurbished. To Bothwell she only gave a second-hand genet fur, recycled from her mother's cloak. Later, she broke down in tears before Bishop Leslie, repenting of her Protestant wedding. Two days after the wedding, Mary and Bothwell were heard screaming at each other, Mary calling for a knife that she might kill herself. The next day, she threatened to drown herself. The marriage, which ended a month later at Carberry Hill, was an unhappy one. On public occasions, Bothwell displayed an exaggerated deference for Mary, but otherwise, he was rude, jealous and violent, and delighted in humiliating her in public. It also leaked that he was maintaining his ex-wife, Lady Jean Gordon, whom he had divorced in order to marry Mary, in Crichton Castle. To appease him, Mary gave up all her little pleasures such as card-playing, hunting, golf, hawking and music.